Naked Wedding Cake Orsett – Orsett Hall, 4th August 2016. Huge congratulations to Abbey and Ross who were married at beautiful Orsett Hall on 4th August. Possibly the most organised couple I’ve come across so far! They ordered their wedding cake almost 2 years ago after Sticky Fingers Cake Co were recommended to them by a former customer of ours, which is always lovely. 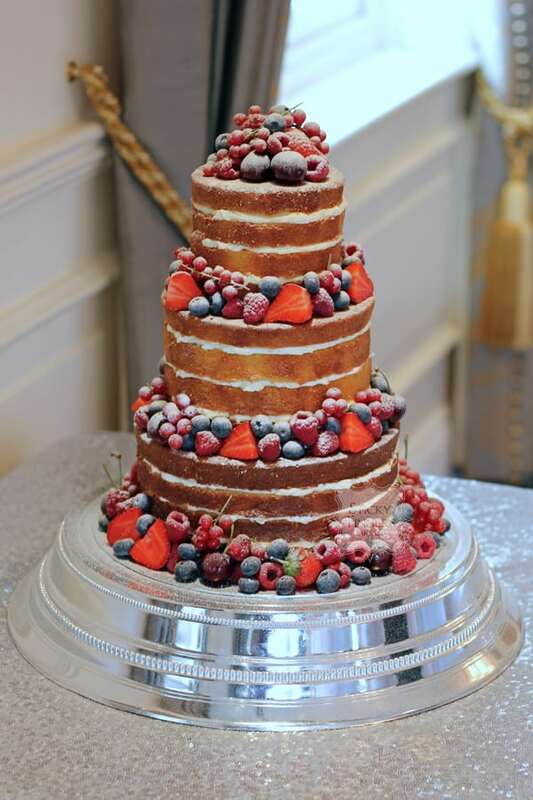 They chose to have a 3 tier naked wedding cake, decorated with fresh summer berries and a dusting of icing sugar. The flavours were white chocolate and passion fruit, Madagascan vanilla and lovely lemony lemon cake. Rather than the traditional tree slice cake stand the cake was displayed on Orsett Hall’s silver cake stand which made a nice change and with a sparkly table cloth, it all looked very glamourous! Have a long and happy life together Abbey and Ross..